to see her creations using the components I sent her. Cynthia generously sent me several pieces of sea glass from Cuba and a beautiful large pendant made from paua from New Zealand. 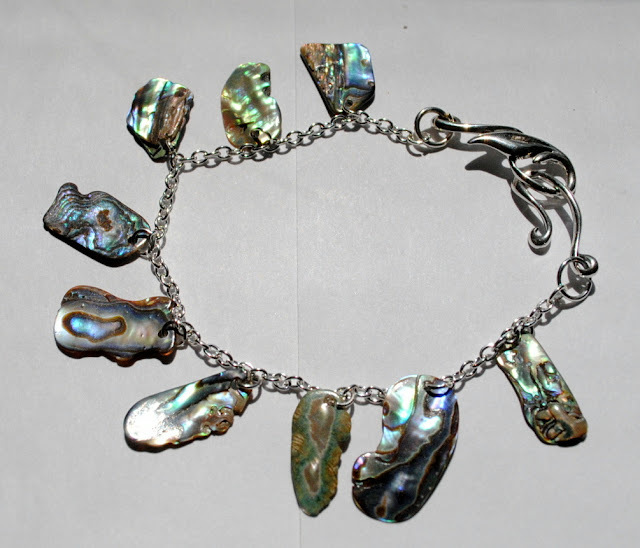 She also included quite a few paua chips and a stunning leaf toggle clasp. I have to be honest...the biggest challenge was incorporating the toggle clasp into a design. I didn't want to hide it away at the back of a necklace, but I tend to lose bracelets that have toggle clasps. So I started out with designing a piece of jewelry using the sea glass because that's what I know the best. I wanted to make several pieces with the various colors of sea glass, but because of the terrible storm that hit the East Coast several weeks ago (we lost power for 6 days and are still trying to clear away the branches and fallen trees), I just didn't have the time. But I will be sure to post them as I get them designed and created! to move out of my comfort zone. that would showcase my sea glass pendant. to complete the color palette. to create this dazzling summer look. so that the natural beauty of the sea glass shines through. 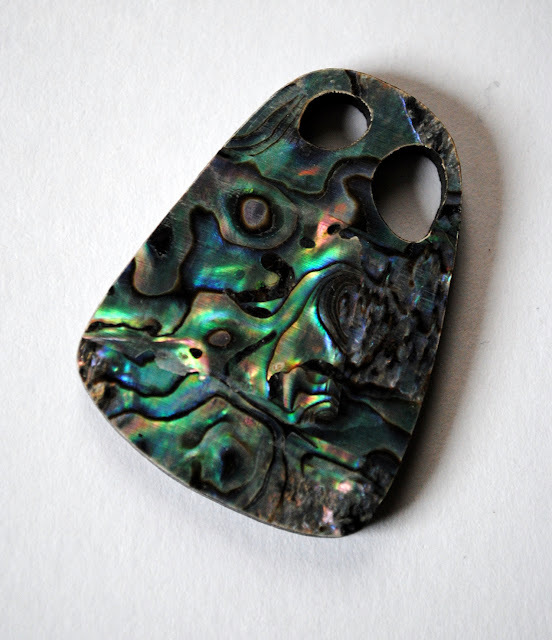 Next I turned my attention to this fabulous paua pendant. the shades of aqua, or teal or purple that shone so brilliantly in the sunlight. And no matter what I tried, a necklace that focused on one color just looked out of place when next to this amazing pendant. to the beauty of the paua shell. find the colors she needed for her necklace. And that's when I really looked at my pendant. that changed each time I moved it in my hand. that showcased the amazing display of colors. to stand out but not overwhelm the rest of the design. that it draws your eye away from the pendant. but it didn't have the flow that I wanted. it seemed fitting to use my new skill for this challenge. When in doubt, go back to what you love, right? off a simple chain would be something pretty amazing. I guess by now you've realized that I was designing these pieces for myself. 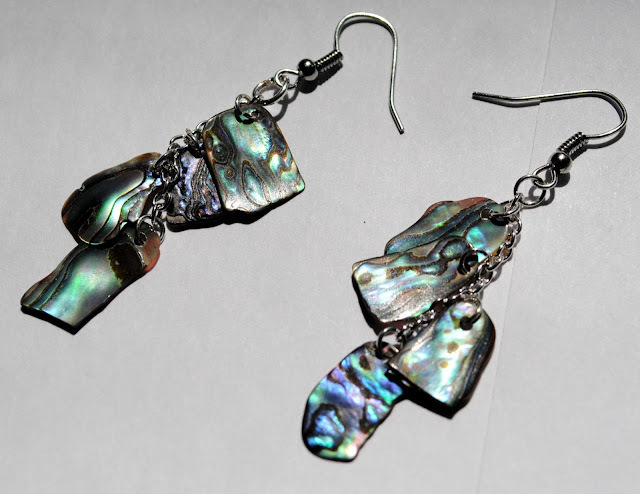 And the best part was that I had just enough paua chips to make a pair of dangle earrings to complete my new jewelry set! 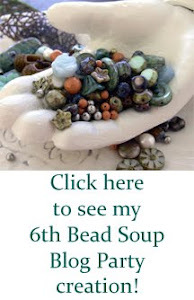 I'm so excited to be a part of this year's Bead Soup Blog Hop and can't wait to see what Cynthia has created with the pieces I sent her! 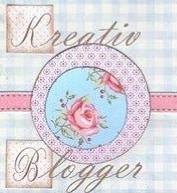 Be sure to check out as many blogs as you can...there are so many amazing and talented artists participating! And don't forget that there are two more reveals this year to see what everyone else has created with their Bead Soup! Love your work, and the thought process behind it! Enjoy your new jewelry! Beautiful designs! I am so impressed by your seed bead weaving. Thank you, Lisa! I'm just starting out on my seed bead weaving journey...loving every minute of it! Very lovely, stunning pieces ! You're right, the neutrals just make the shell POP ! Thanks, Audrey! I'm learning that the journey is just as enjoyable as the destination! Thank you, Shirley! I appreciate the comments. Although I wanted to try to learn to make a beaded bail for the paua pendnat, I figured leaving it simple for now would make it easier to exchange later! Awesome feast - you rocked the shells and the sea theme... Love the bracelet and earrings! I love how you incorporated spiral rope with your necklaces... your inspiration definitely led your fingers through the work. Love! spiral rope is one of my favorite stitches also, I tend to use it when nothing else seems to work. love the wire wrapped beach glass pendant, great job of wrapping. Wow! The pieces you received are so beautiful and you did them justice, setting them off beautifully. The clasp is gorgeous, no wonder you didn't want to hide it! Lovely work! What a pile of beautiful! Beautiful beadwork. Love the charm bracelet. I think that you showcased that shell focal perfectly. And with the dark strand, you could wear it with just about anything. Fantastic soup. And bravo to you for getting everything done on time with Mother Nature throwing you one heck of a curve ball! Thank you, Karyn! I appreciate the comments! Wow...while I truly love everything you made, that black necklace is SUPERB!!! I an see it around my neck right now! !, you did a beautiful job on all of your pieces! Having a problem with blogger...benn trying to leave a comment (i hope you don't get duplicates from me!). Anyway..everything is beautiful, but I am particularly drawn to your black necklace...truly superb!!! I would definetly wear it! your jewelry is amazing! I love the black necklace the most though. You really put a lot of work into your pieces!with amazing results! Ok, I confess, too. I would make every piece with apiral rope if I could get away with it, so I loved these. I feel like I had a beach vacation just sitting here in my easy chair. Thanks for this! Thank you for sharing your thought process during your creative period. Love the paua necklace. Absolutely gorgeous! I have sea glass but I stink at wrapping it! You did a marvelous job! And thanks for coming to my party! Wonderful use of colors to highlight your focals....your brainstorm on the paua focal was brilliant. Lovely work. I absolutely love every single piece you made. You are by far one of my fav designers. You took me back to my visits to the beach with every single piece. GREAT job. Beautiful! Just Beautiful! I love the orange with the beach glass and aren't you glad you took one more look at that focal. The blacks in the different finishes is perfect. Great job. I love those spiral necklaces and the paua earrings. I have to say the black/blue necklace reminds me of the islands....... the chip earrings are fun too. I have never made something out of this spiral but have done a sample piece and have been thinking about doing one and you made both pieces look so lovely, I simply must give it a try! Wow! Wow! Wow! I think my favorite is the orange. It really makes the sea glass "pop". Gorgeous work. The orange necklace is my favorite! That is my color! Nice job! I usually don't care for seed beads but that stitch and the larger beads just draw the eye. And my eye is definitely drawn to your shell necklace. Gorgeous work! These are great! I really like the orange with the brown and he black really does allow the blues to pop :) Very well done! Lovely Cindy! You're right, the black rope really does let the paua pendant stand out doesn't it! Nice designs. 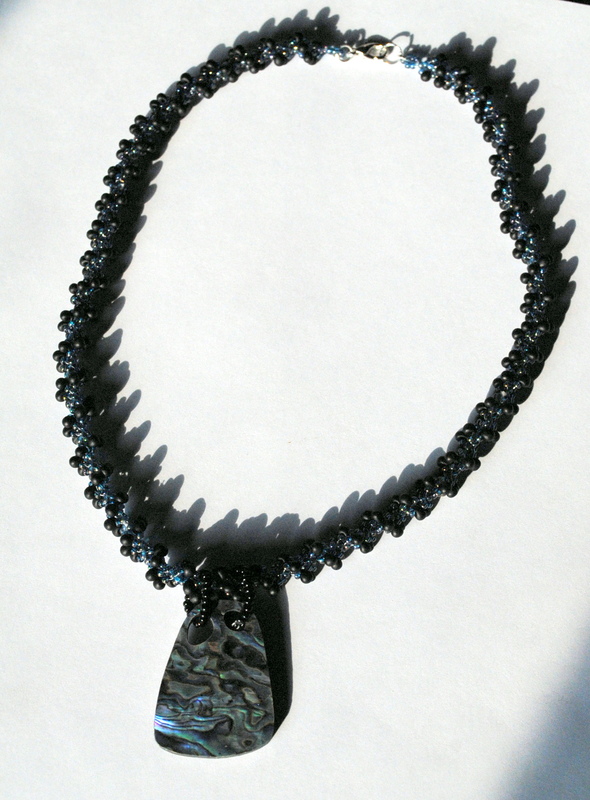 The black with the paua shell was the perfect choice to make it stand out. Love the little charm bracelet. Oh my gosh...Awesome use of the beaded spirals with the pendants, and the bracelet is just too much fun! Nice job! Nice job on your soup ingredients. Really love the paua shell focal necklace! As someone who is not usually a fan of orange, I find the shade of orange you chose for the brown sea glass quite mesmerizing. As well, the black and gray worked exceptionally well with the shell focal. Wonderful, wonderful work!! Fabulous beadwork, I love your colour choices. Great job, I love the earrings, They would be so fun to wear. Ooh! I'm liking your wire wrapping on the beach glass. That sets it off beautifully. Lovely! 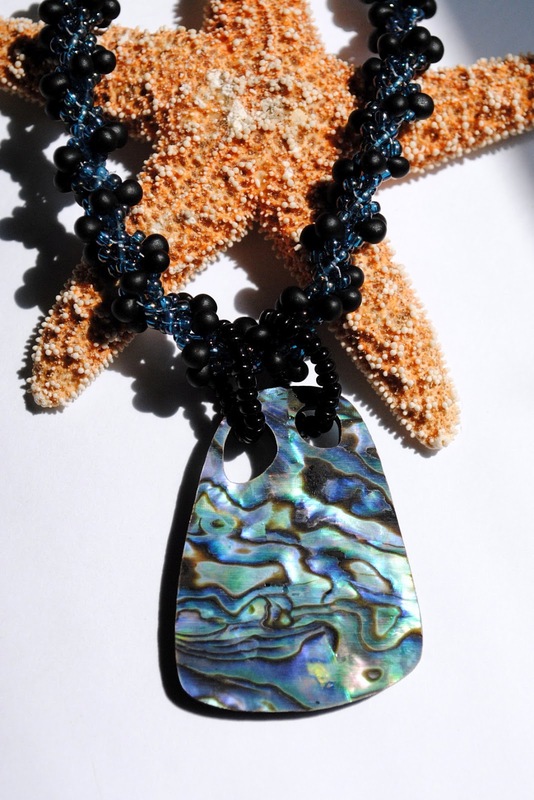 Love the paua pendant necklace! The bracelet's great too - and you managed to use the clasp :) Well done! I am just starting to learn some new bead weaving patterns...your pieces are wonderful....really like the blue! Wow I love your designs they are gorgeous. I really like the paua shell set and I do not blame you one bit for wanting that set for your self. You did a fantastic job of picking out the perfect seed beads for both necklaces. Beautiful, beautiful, beautiful! This is the first blog I have visited which showcases beadwork - what a fabulous piece you created with the amber colored sea glass - lovely work! Love the use of drop beads, great job with all of your pieces. That is one yummy soup you got to play with! I LOVE the wire wrapping you did with that brown sea glass! And you are quite the seed bead weaver!!! And I love the Paua shells!!! You did a fantastic job with everything! Love it all!!! I like spiral ropes. 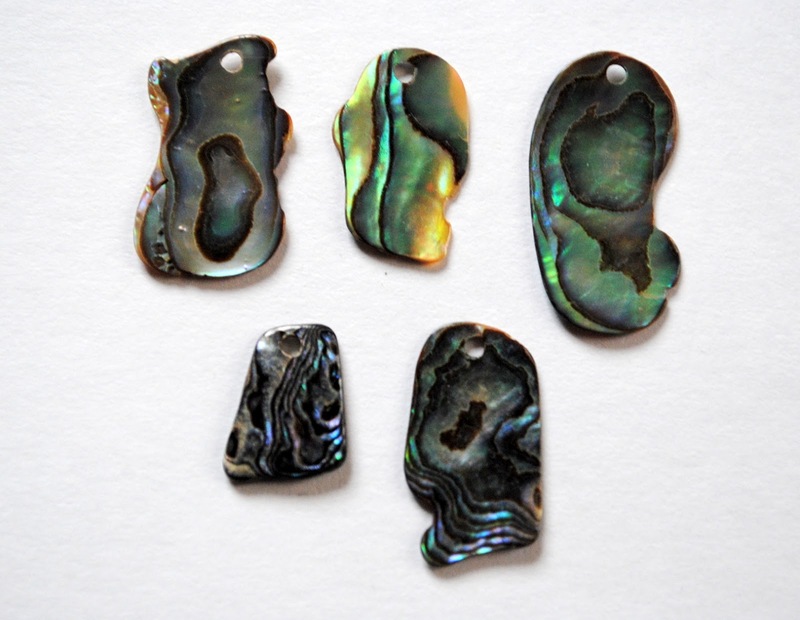 What you did with the Paua shell pendant is awesome. You picked great colors. They set off the focal without overwhelming it. 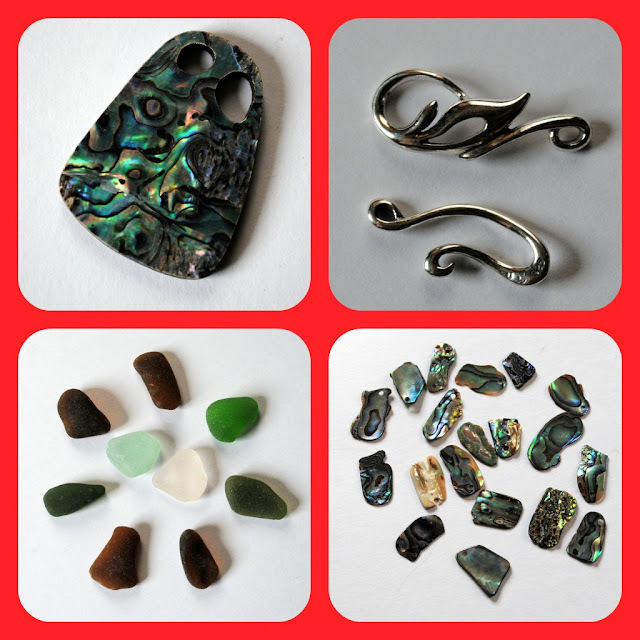 That paua shell pendant necklace is my favorite and the colors you used for the spiral were terrific! It's amazing! I am sure you are going to love wearing that whole set, though. What a success! 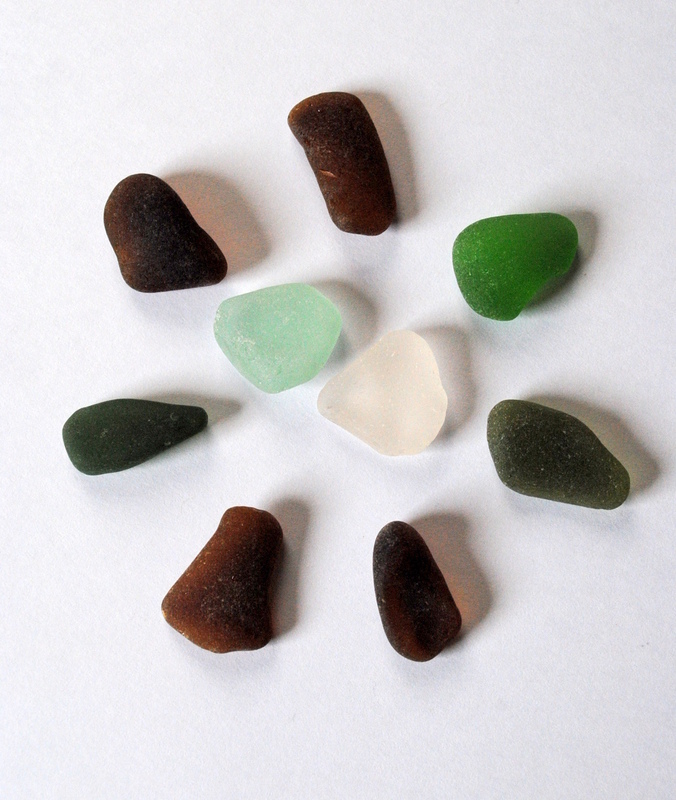 How wonderful you still have so much beach glass to play with, too. Love hearing about how you created your pieces! 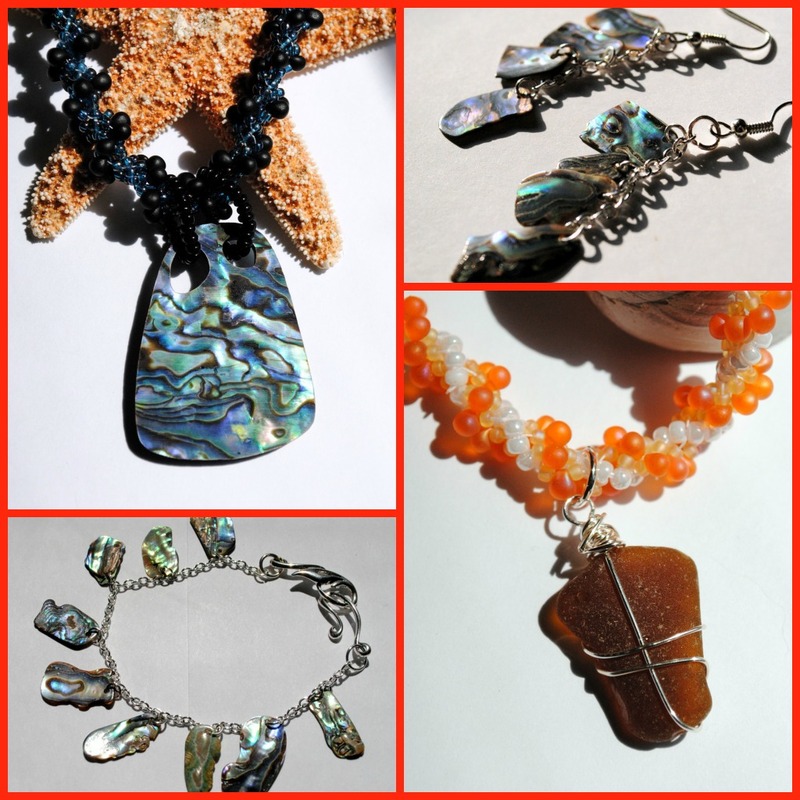 I just love the paua shell necklace and the beads you finally decided to use! Also great work on the bracelet!!!! the paua chips bracelet and earrings are my favorites - I'm sure they look terrific on a sun light!!! Love your beaded ropes! Lovely designs! I really like the earrings that you created. They have a very contemporary look to them. Your sea glass wrap is awesome too. love the bracelet and the earrings! Way to step out of your comfort zone. 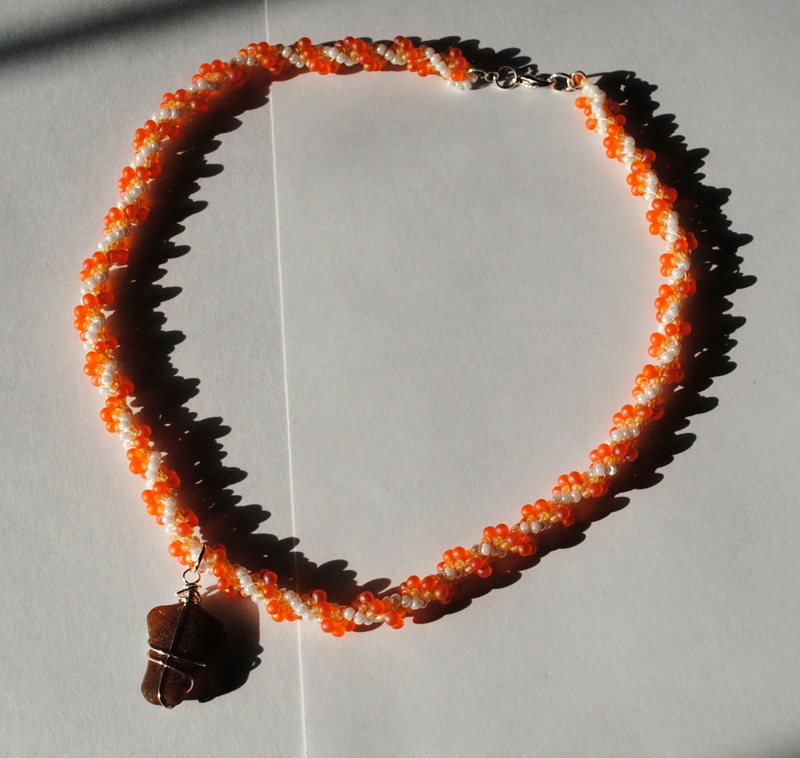 I would have never thought to put those orange beads with the brown glass. It looks fantastic. I love all the pieces you have come up with. I also really liked the bail on the two hole piece. 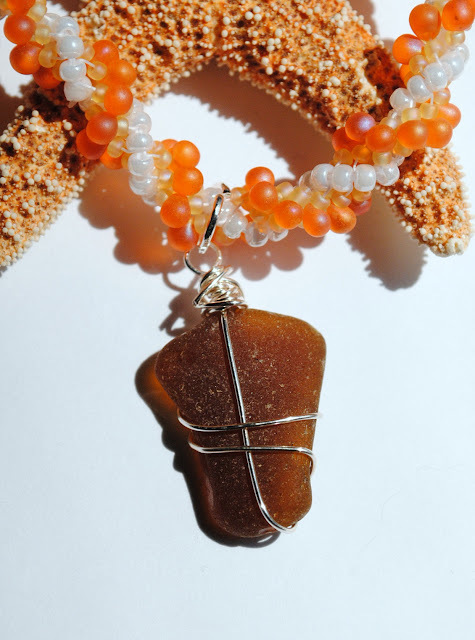 Your pieces are wonderful: I loved the way you used the ornage to pull out the beauty in that brown sea glass. And the set: it's perfect, I love the iridescence of the chips and focal. Beautiful! Beautiful collection! Sorry I am late in commenting. Too much on my plate. Both of your spiral necklaces are beautiful.... this too is one of my favorite stitches. I have never done it with drop beads, I love the look.